Qatari-owned Al-Jazeera news network shuts down its Egypt channel, quieting a major source of tension between the two countries. The Qatari-owned Al-Jazeera news network on Monday shut down its Egypt channel, quieting a major source of tension between the two countries at a time when regional efforts are underway to reconcile between the two countries over the Gulf nation's support for Islamists, reports The Associated Press (AP). Qatar has been the main supporter of the Muslim Brotherhood and was a powerful backer of ousted Islamist President Mohammed Morsi. The most dramatic manifestation of the tensions has been the arrest, trial and prison sentences for three journalists from Al-Jazeera's English channel on terrorism-related charges for allegedly helping the Brotherhood. 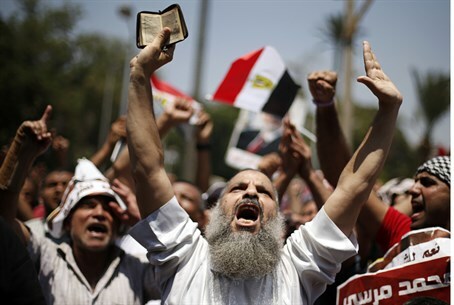 Al-Jazeera said Monday it will incorporate Mubasher Misr into a new region-wide station, according to AP. It said the Egyptian station will only resume its work when it can get proper licenses in Egypt "in coordination with Egyptian authorities." The decision Monday came two days after a Qatari envoy met with Egypt's President Abdel-Fattah al-Sisi, the first such meeting since he was elected in June. Al-Sisi’s office said Egypt hoped the meeting, which was attended by a Saudi royal envoy, was the beginning of a "new era" that puts the past disagreements between the two countries behind. Last month, Gulf countries, led by Saudi Arabia and United Arab Emirates, reached a reconciliation agreement with Qatar aimed at easing regional tensions linked to Doha's support for Islamist groups throughout the region. Egyptian TV on Monday hailed the shutting down of Al-Jazeera's local branch as the first sign of restoring good relations with Qatar. "This is a translation of the Saudi initiative to restore warmth to Egyptian-Qatari relations," a broadcaster on the private Egyptian CBC station said, according to AP.